Forty kilometres from Oudtshoorn, at the foot of the Swartberg lies the natural beauty of De Rust, a little farm village with a peaceful environment. Like Oudtshoorn, De Rust is known for its Ostrich farming and historical buildings. Its drinking water from a mountain spring puts expensive bottled water to shame, and it lies snuggled in the mouth of Meiringspoort. 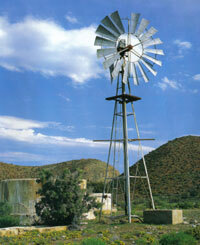 Everything about De Rust is true, true hospitality, true Karoo environment and true peace and quiet. The main attraction of De Rust is Meiringspoort with its incredible passageway of various towering sandstone cliffs that pierce the heart of the Swartberg Mountain Range. Winter: Sunny and dry with regular snowfalls on the Swartberg Mountain Range. Nightly temperatures vary between 3-5°C. Summer: Mainly windless with temperatures between 27-37°C and occasional thunderstorms. The plant life on the mountains is exceptional including species such as mountain Fynbos, Renosterveld, Karoo-veld, Spekboom, Aloes, Proteas as well as the well-known Pelargonium zonale, the ancestor of all Geraniums, which was first collected during 1689 in Meiringspoort. A large variety of animals i.e. klipspringer, grey rhebok, kudu, dassies and baboons to caracal and Cape mountain leopard are found in this area. Some of the most primitive beetle species (Colophon spp.) in the world can be found on the peaks of Meiringspoort. An amazing collection of bird life is also found here e.g. black-, fish- and martial eagle, Cape sugarbird and pied kingfisher. Meiringspoort: Waterfall, Story of the Mermaid, "Herrie se klip"
Stompdrift dam: Biggest dam in the Klein Karoo - water sport and fishing. The centuries old sedimentary layers in the picturesque Red Hills at Le Roux Station: In 1989, the Red Hills were declared as a national natural heritage site. Mons Ruber: Wine bar in remembrance of the 1947 visit by the British Royal Family.